Our Model T001 is a Multi Directional VHF + UHF HDTV Flat Panel Antenna and is capable of pulling in some serious channels with a 110 mile range. Our antenna will come equipped with an array of different elements which will allow to pull in both local and distant HD channels. This antenna comes with the needed hardware to mount to your antenna pole. * Impedance: 75 Ohm - Waterproof Dipole Box with F Connector. 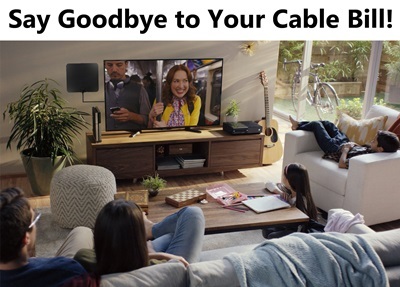 * Pull in both local and distant 1080P, 4K and 3D HDTV channels. * Easy Tool Free Installation, 4 Step Assembly. * For the Best Reception with this Antenna, Use our Signal Booster Amp. Are you looking for OUR BEST Outdoor HDTV Antenna? Here it is! – If your budget can handle this antenna, this is our best choice for pulling in stations. We have the Antenna Solution for you!! 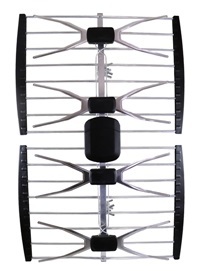 Our Model T002 Directional VHF + UHF HDTV antenna is capable of pulling in some serious TV channels. Our antenna will come equipped with an array of different elements which will allow you to pull in both local and distant HD channels. This Antenna is 43 inches long and 36 inches wide and has 42 elements. Due to its size it will pull in more stations further away from your home than any smaller size TV Antenna. Many people are fooled into thinking that a small antenna will pull in as many stations as a larger antenna. Just thinking about the basic common senses of it will tell you the reality of what is the truth. The simple rule is the more elements along with size, the better the antenna will perform, period, no matter what any one claims or says. * This HDTV Antenna is for VHF & UHF Channels. * Gain: 10-15dB ; Channel: (VHF 5 -12) 170-230MHz (UHF 21-60) 470-790MHz. * Waterproof Dipole Box with F Connector. * Easy Tool Free Installation, 6 Step Assembly. 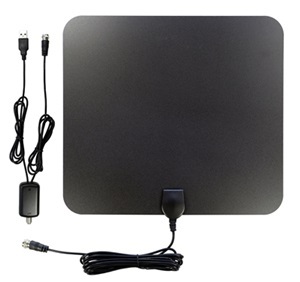 Are you looking for the BEST Indoor Flat Panel HDTV Antenna + 25 DB Amplifier? Look no further! – We have the Antenna Solution for you!! 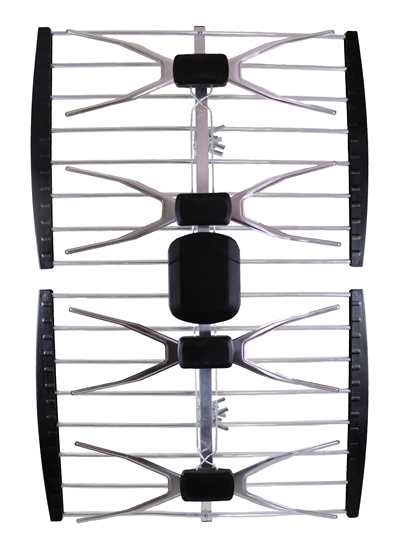 Our Model T003 Multi-Directional VHF + UHF HDTV antenna is capable of pulling in some serious channels. Our antenna will come equipped with an array of different elements which will allow you to pull in both local and distant HD channels. ✔ START SAVING MONEY - Stop paying your Cable or Dish bill to pull in your local free TV Stations. (ABC, CBS, NBC, PBS, FOX, Univision, and other local stations) These are broadcast stations which can be picked up crystal clear in 1080P/4K for free with our antenna. ✔ IMPRESSIVE 70+ MILE RANGE - Our Indoor HDTV antenna is capable for pulling in stations 70+ miles away!! This is possible with the included Premium +25 dB inline Powered Amplified Booster. If you're located closer to broadcast stations, use without the booster may provide better results. ✔ 100% SATISFACTION GUARANTEED!! - We stand behind our quality antenna 100%. No matter what the question is, Email/Call our technical support staff located in Wisconsin for advise on install or which antenna to buy. Not happy with your antenna? Return your antenna for an exchange to an antenna that works better for your location or simply for a full refund with-in 30 days. 1 Year Manufacture Warranty. 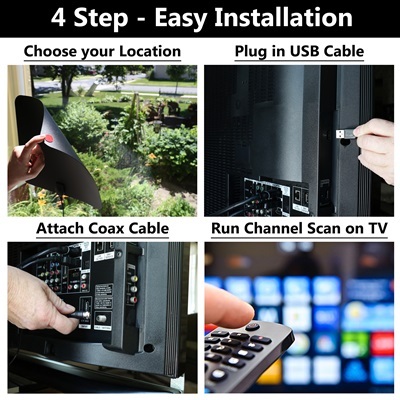 ✔ 4 STEP EASY INSTALLATION - Install usually takes less than 4 minutes. 1) Remove film from double side sticky tape, place in your antenna location. 2) Plug USB power cord into your television. 3) Attach coax cable onto the antenna input on your television. 4) Run your channel scan in your TV menu and start enjoying Crystal Clear HDTV; FOR FREE - See attached video below for Product Overview and Installation information. * Frequency: VHF (170-230MHz) UHF (470-862MHz). * Gain: 25dB Without Amplifier - 50dB With Amplifier.